1. Let's use lists to show latest 3 job views. 1. 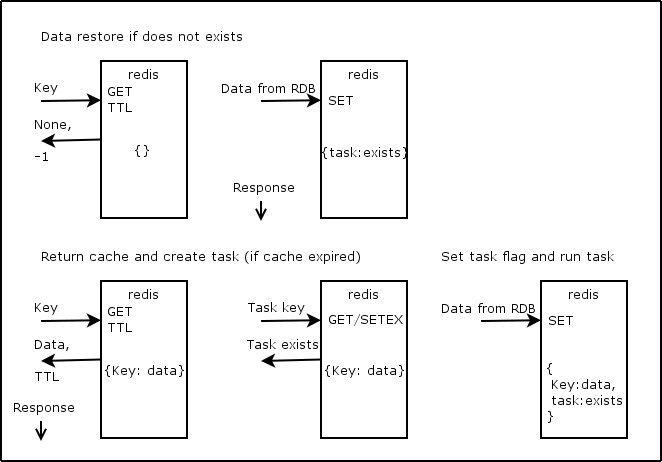 In some cases redis/cache may be more efficient then replication for RDB. Lets imagine that we have some heavy task that returns a number that we need to show to our customer. Instead of to run this task on every request (with same parameters), we save result to memory and return it next time without task execution. Periodically, when we need to refresh data, we run task again. # 2015-08-24 15:53:51,162 Sleep 3s. # 2015-08-24 17:30:34,461 Update cache. # 2015-08-24 17:30:34,462 Run hard task. # 2015-08-24 17:30:35,480 Update cache. # 2015-08-24 17:30:35,480 Run hard task. # 2015-08-24 17:30:36,484 Get cache: 10. # 2015-08-24 17:30:36,485 Update cache. # 2015-08-24 17:30:36,486 Run hard task. # 2015-08-24 17:30:37,483 Get cache: 10. # 2015-08-24 17:30:37,487 Update cache. # 2015-08-24 17:30:37,487 Run hard task. # 2015-08-24 17:30:38,491 Update cache. # 2015-08-24 17:30:38,492 Run hard task. # 2015-08-24 17:30:39,483 Get cache: 10.
update_hard_task_cache executes every 2 seconds. The second issue is easy to fix: use flag in redis that shows that one of instances already took this task. # 2015-08-24 18:28:21,710 Update cache. # 2015-08-24 18:28:21,711 Run hard task. # 2015-08-24 18:28:22,715 Get cache: 10. # 2015-08-24 18:28:25,700 Get cache: 10. # 2015-08-24 18:28:25,700 Update cache. # 2015-08-24 18:28:25,701 Run hard task. # 2015-08-24 18:28:26,703 Get cache: 10. The idea that we check for time expiration manually and run update task if required while returning expired cache to user. # 2015-08-24 18:48:42,284 Run hard task. # 2015-08-24 18:48:43,289 Get cache: 10. # 2015-08-24 18:48:46,277 Get cache: 10. # 2015-08-24 18:48:46,277 Run hard task. # 2015-08-24 18:48:47,274 Get cache: 10. # 2015-08-24 19:30:15,547 Run hard task. # 2015-08-24 19:30:16,550 Get cache: 10. # 2015-08-24 19:30:19,542 Get cache: 10. # 2015-08-24 19:30:19,542 Run hard task. # 2015-08-24 19:30:20,542 Get cache: 10. # 2015-08-24 19:30:21,541 Get cache: 10. 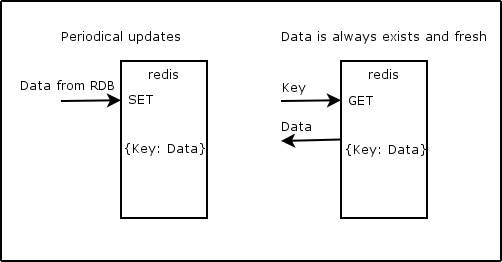 If some data updates a lot, it may be more efficient to keep the most recent data in redis and push it to RDB periodically. In this example we will allow to user to send password reset request only once per 5s. # 2015-08-24 20:03:15,705 Email was sent. # 2015-08-24 20:03:15,706 Please try later. # 2015-08-24 20:03:20,712 Email was sent. Let's count views of job posting. We will store relations (job_id/user_id) in RDB to be sure that views are unique. We can solve this problem keeping counters in redis. What if counter expire or someone will flush redis db? In this case we can easily restore count from RDB. If we haven't ability to restore counters easily, we need to backup counters values to RDB periodically. Another key point about restore function is that we don't want to keep all data from RDB in redis, we need only one that our customers ask for. So, if no one asks particular data, we can remove it from cache. In case if someone will ask it again, our restore function will put the data back to redis. What if we keep user session in redis and we need to show these jobs with views counts. Will we do two requests to redis?
""" Save to RDB. """ See also how twitter uses redis to store user feeds. "I recommend using both tornado-redis and redis-py clients for your Tornado Web Application. Use tornado-redis to subscribe to Pub/Sub notifications and for blocking commands such as BLPOP, BRPOP, BRPOPLPUSH. You may safely use redis-py for most of other cases." > # check number of connections, memory, etc. # DON'T DO LIKE THIS! Time complexity for keys is O(N) with N being the number of keys in the database!